I live in a religious community in southern Iowa. I moved here in January 2002, right out of college. (True, my parents were not very excited about my "wasting" my education.) One of the many great things about our community is the sense of both unity and freedom I get from everyone working together. Another is being able to produce most of our own needs. We live completely "off the grid" and do all of our farming with horses. When I moved here, we grew field crops of wheat, corn, rye, oats, sorghum, and potatoes, as well as a great variety of garden produce. We milked cows, made cheese, sheared sheep, spun wool, raised chickens and ducks, and sewed our own clothing. Since then, we have planted a large berry field, a vineyard and an orchard. In the same time, we've built a carpentry shop, a leather shop and a machine shop, all powered by horses. The list goes on and on. I love it because I feel so free from dependence on "society." I also feel free to be worshipful and mindful about my work and my relationships with God, nature, and my fellows. After the three of us returned from the workshop, we were very excited and determined to build with cob. We presented the idea to the people of our community and we decided to build two houses as an experiment. We wanted to see what we felt in the building process, how the homes heated, how much they cost, and so on. 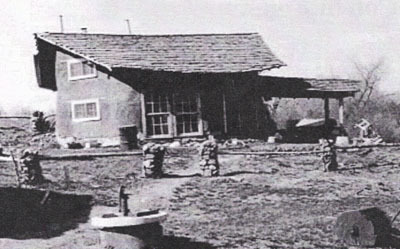 The following May, we began construction of the two houses, but were only able to finish one (by February). The other stood half finished until the following April, when we began cobbing again; it was finished in October. One of the first challenges we faced was a complete change in our mode of thinking about our building practices. We live in a community where we raise our own food, horse farm, raise livestock, etc. Our wood framed houses had typically been built in the fall and winter months by just two or three men after our summer work of raising food and mowing hay was finished. We were not ready for the change to cob, which is more labor intensive on site and also must take place in the summer months. Then there was the cost. The wood frame houses cost anywhere from $8,000 - $12,000. Our first cob houses cost around $7,000 each, including new cedar shake roofing, new wood windows, rock, gravel, tongue-and-groove wood ceilings, stove pipe, lime plaster, and assorted other costs. We were in a hurry and didn't take the time to hunt and peck for much used or found materials. On the positive side, everyone liked the way they felt; so solid and quiet and part of the hill the clay was taken from. The second summer, when we finished my house, was when we really started developing cob for our lifestyle. We learned that Gaab cobbing, instead of forming cobs, and using wheelbarrows to haul mixes to the wall saved 50% of our time. We would cut the finished batches of cob into basketball sized pieces and heave it up to a worker on the wall. This worked great because most of the people working on the site were men between the ages of 15 and 25. There were usually between four and seven workers on the site every day, and it still took from April until October to finish. Our first two houses took 576 and 1,100 batches respectively. (A batch = 5 gallon clay + 5 gallons sand.) The houses are exactly the same size, but the first one is backed into a hillside and so the north and west walls are half rock instead of all cob. The next project was a boy's bunkhouse built by our 16-year-old neighbor for himself, his brother, and a cousin to live in. He had worked on our house and wanted to try building his own. 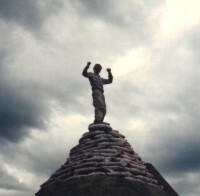 He began the previous fall by collecting fieldstones of every size and hauling them to his site. He built a 14'x18' capsule-shaped house, put recycled windows in it, and thatched the roof with our own rye straw. It cost around $100 and took 300 batches of cob to build with most of the construction being completed during the spring after school each day. This was a huge advancement for us in our quest for independence from supporting society and having to buy everything. It took a lot of planning and was smaller than other houses, but the cost was just a fraction of what the others had been. Our next big step came in 2005 when we began to use our workhorses to mix cob in order to save on manpower. On our farm, our relationship with the earth and our animals is special to us. We wanted to make more cob at one time and find a way for older men to build with cob without having to rely solely on the young men to foot stomp. We all help one another with our projects, but in our quest for self-sufficiency, we can sometimes stretch ourselves rather thin - so we tried mixing cob with horses. We had an old dried up pond with a broken dam, and inside we made a hard pad to load the materials onto and started driving a team of Belgians over it. It was difficult to get the mix correct because you were always scooping dry clay from the bottom and it would chunk up the cob. We DID produce more cob with two people and a team of horses than the two people could foot stomping. Even with all the kinks and the learning curve that first year, we still managed to build one and a half houses by this method. The following spring, we poured a concrete pad in the "cob yard." It has dished sides and forms a circle for the horses to walk on. It holds the cob in and keeps the water from escaping the mixture. We now mix 60% silty clay from one location in the pond with 30% pure clay from another, adding sand accordingly to get the mixture correct. We haul water in a 250-gallon tank to the edge of the cob yard. It takes about one to two hours for horses to mix a full load on that pad. The horses mix for 15 minutes, and then we use shovels and potato forks to turn the mixture thoroughly, which is the hardest part. We repeat horse stomping and shovel turning 3-5 more times until the mix is consistent. Next, we add the straw and have the horses finish it off. Sometimes we lead and sometimes we ride the horses around the circle. When the mix is complete, we hook them to a wagon, load the wagon with cob and deliver it to the house site. The cob is so heavy and the mix is so big that it usually takes four wagonloads to empty the whole cob yard. Each full mix in the cob yard takes two men three hours to load the materials, 1-2 hours mixing, and 4-6 hours to haul with one team and wagon. It yields between 100 and 125 "batches" of cob depending on how full you load it. That is pretty amazing for two people in one day. It is a hard day's work, but you usually spend the rest of the week building with your huge pile of cob. To illustrate the labor savings, let me tell you that in a community-wide building day, 50 people were able to foot stop and build 110 batches during my house construction, but that only happened once. Our houses average around 20 feet in diameter, requiring about 750-850 batches of cob each. That means only six or seven days of mixing with the horses. We have found that this method uses more water and the batches get wetter than with foot stomping, but that doesn't make much difference when you have to cover it and keep it moist anyway over the week while building. The quality is pretty good, but for really fine detailed work, nothing can replace foot stomping. Recently, we have tried using a lister, which is a shallow bottomed, two­way plow, to turn the mix for us. Once we work out those kinks, this innovation should cut mixing time by a third. We currently have five completed cob houses in our community, with five more to be finished over the summer of 2009. We still build wood houses for community members who prefer wood and want to buy the lumber. We still have those who would rather foot stomp all of their cob, while others want their cob made in the cob yard. It all comes down to personal preference. One thing that EVERYONE likes is that our cob houses use about half as much firewood per winter as the wood framed houses, and they are warm, snug, and beautiful. Our cob houses that are earth-bermed save as much two-thirds of the firewood. 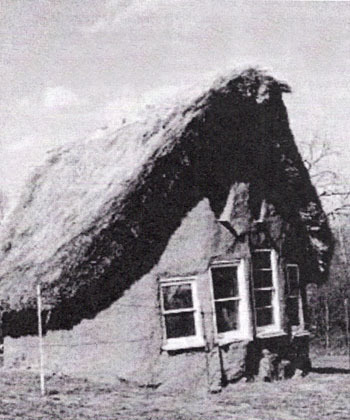 We've had people come visit us because they were told cob houses wouldn't work in the Midwest. They've been very happy to learn that was incorrect. We are all very grateful for our exposure to cob and all that it has done towards helping us be closer to the earth and to self sustainability. Cob has been a blessing and an answer for our community as we continue to head toward our goals. We now have 7 completed cob homes in our Community. We have one under construction awaiting the spring thaw, and two more in the planning stage for this spring/summer. We got that lister to work, and it is wonderful. Cuts the mixing time more than half and you also get a better mix. We have recently been considering teaching the thatching craft - either in a workshop format or one-on-one. If anyone is interested in that please contact us, because that takes a lot of prep work and we'd like to know if there is any interest. Thatching is something you've really got to experience and we're currently building a whole village of homes with home-grown rye straw thatched roofs. They are gorgeous.